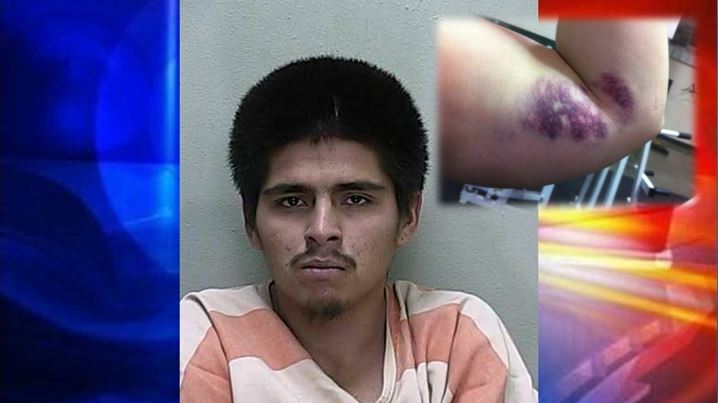 Victor Daniel Garcia and a photo of injuries that Deputy Galler sustained. Ocala, Florida — Officials say an illegal immigrant from Mexico was arrested after he broke into a house, assaulted a young woman, then later attacked two deputies. Victor Daniel Garcia, 19, entered a house located in the 1000 block of Northwest 112th Court, Ocala, through a window and immediately made his way to a back bedroom where a young woman was sleeping. Garcia broke the bedroom door to gain entry. According to the Marion County Sheriff’s Office, Garcia attacked the woman by punching her several times with a closed fist while she was in bed. The victim told authorities that she attempted to leave the bedroom, but Garcia grabbed her by the neck and tried to strangle her. The victim was finally able to break free, retreat to her roommate’s bedroom, and call 911. The victim then ran out of the residence. When deputies arrived at the incident location, they found Garcia hiding in a bathroom. According to reports, as Deputy Peters attempted to handcuff Garcia, he broke away and punched the deputy in the face. The force of the punch broke the deputy’s $300 pair of glasses. Garcia then struck the deputy several more times with a closed fist. According to reports, Deputy Peters had to utilize the vertical fist punch to create distance between himself and Garcia approximately four more times. Outside, Deputy Galler was walking around to the front of the residence to check on Deputy Peters. Deputy Galler reported that as she got to the front of the residence Garcia ran out, leaped from the top of the stairs, and slammed her in the face with his elbow on the way down. Deputy Peters then escorted Garcia to the ground. Deputy Galler stated that Garcia continued to resist and tried to kick her several times while she attempted to restrain his legs. Two more deputies had to assist with gaining control of Garcia. Garcia was then handcuffed and placed into the back of a patrol car. While Garcia was in the back of the patrol car, he was able to move his hands from behind his back to his front. Garcia was then removed from the patrol car, at which time he resisted and was escorted to the ground. A Hobble was then utilized to secure Garcia in the back of the patrol car. He was charged with Burglary with Assault and Battery, Resisting Arrest with Violence, and Battery on a Law Enforcement Officer (x2). Garcia is being held on a $65,000 bond. His next court date is scheduled for December 1, 2015. Officials did not say whether or not Garcia would be deported. Both deputies are expected to make a full recovery from their injuries.